Peru is located on the Western tip of South America, just north of Chile. It was originally populated by the Inca Empire – you know, the group of people that built the famed Machu Picchu and conquered much for the western side of South America. They had ingredients like maize (corn), quinoa, peppers, and potatoes. I was surprised to learn that potatoes have been cultivated in Peru for thousands of years and are actually the origin! The Incas not only ate potatoes, but used them to treat ailments topically such as broken bones, facial blemishes, frostbite, and sunburn. They even told time based on how long it takes potatoes to cook. So every day when you’re having potato chips or pommes frites, think about how far the humble potato has traveled from it’s cultivational birthplace in South America. Once European settlers came in, the population started becoming much more diverse. Explorers from Spain, Germany, and Italy came in and began to settle and brought Old World foods and techniques. They introduced onions, garlic, pork, cabbage, apples, and other ingredients. People from Africa introduced yams and peanuts. The Chinese brought stir fry cooking techniques dubbed “chifa” in Peru. All of these factors and influences make Peruvian cuisine a fantastic petri dish for fusion cooking. In Eric Asimov’s 1999 feature in the New York Times, he quotes Douglas Rodriguez, the chef and owner of Patria in New York as saying: ”Peruvian is the single most important cuisine in Latin America, with a repertoire of dishes maybe bigger than France […] but it’s an undiscovered cuisine, there’s no doubt about it.” We agree and decided that now is the time to explore more. Like most Americans, I was introduced to Peruvian cuisine via the ubiquitous ceviche, the raw seafood dish marinated in an acid like lime juice. I find that ceviche brings the freshness of the sea to you in one of the tastiest ways possible. I love it! Another time, when I was visiting my brother in Pittsburgh during his master’s studies at Carnegie Mellon, we popped into a Peruvian chicken restaurant. It was a delicious spit roasted chicken that was juicy and flavorful served with the most amazing creamy green sauce. The chicken was garlicky and spiced with cumin and paprika with skin that was to die for. Yum! As an aside, J. Kenji Lopez-Alt has a fantastic recipe for this over at Serious Eats. Two for two with damn tasty dishes, but that’s all my exposure had been. Peruvian cuisine just hadn’t migrated to the Land of 10,000 Lakes very much, so there wasn’t much opportunity. So when Peru came up on my list of countries to investigate recipes from, I got excited. Well, if I’m being honest, I’m excited about all the possibilities when I investigate the cuisine of any new country. But being high on my list of places to visit, Peru held extra promise for me. I began my research for dishes like I always do, looking for a typical dish that is served every day, not just for special occasions. Don’t get me wrong, I like cooking the special occasion dishes too; I’m not one to shy away from a challenge with long cook times or unusual ingredients. But my goal isn’t to exotify international cuisines – I want to share the reality of what people are eating. And I found the perfect dish for Peru: Aji de gallina. Aji amarillo is a yellow pepper paste made from peppers native to Peru. I used an organic option by Costa Peruana available on Amazon. They are also available dried or powdered, but if you’re lucky enough to have fresh options available to you, go ahead and use them by all means! Go ahead and order your peppers now because you’re going to need them in order to make this recipe work authentically. Once they’ve arrived, it’s time to get cooking. The process is pretty straightforward. Cooking your chicken breasts with a sous vide immersion bath is definitely the way to go to ensure you have perfectly tender results all the way through, but a traditional water poach works fine too. Serve the finished chicken with boiled potatoes or I chose to use baby fingerling potatoes since they’re reminiscent of the small potatoes that were only the size of nuts originally cultivated in Peru by the Incas before selective breeding grew potatoes to be much larger. Serve with black olives, halved hard-boiled eggs, and boiled potatoes or white rice. Most of the time is inactive time while chicken breast poaches. Delicious and very “homey.” I loved the tender shredded chicken that melts in your mouth. It was perfectly cooked thanks to the sous vide technique. That technique also allows the ability to make ahead if you want. Pre-cook the chicken breasts and chill them and you can finish the sauce up the next day to have a superfast dinner. The creaminess derived from the evaporated milk lends a “Chicken a la King” vibe to it. It is supremely comforting and would be perfect on a cold winter night when you’re looking for a nice comforting meal. While I served it with boiled potatoes as a nod to the Inca origins, I think that white rice would be an excellent choice here so that it can soak up that tasty sauce. The aji amarillo is very mild – not at all spicy. Tastes sweet and savory, like a yellow bell pepper that has been roasted and pureed. Personally, I like some more heat (common theme, right? ), so I reached for the good ol’ Huy Fong. 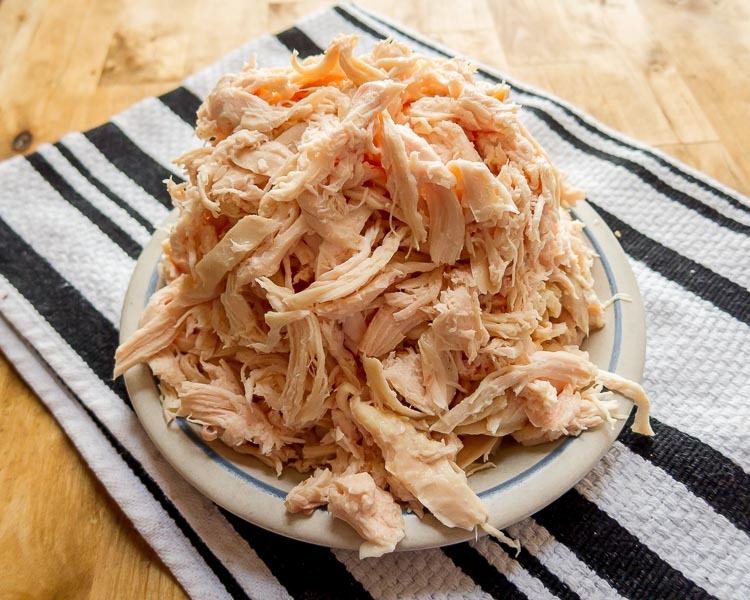 You could add some Frank’s and make a fantastic Peruvian take on Buffalo chicken dip. You can try some simple additions if you want to take this dish down a different, yet still authentic direction. Mix-ins like peanuts would be appropriate and a reference to the African settlers that came to Peru. Grated Parmesan cheese would also be appropriate. 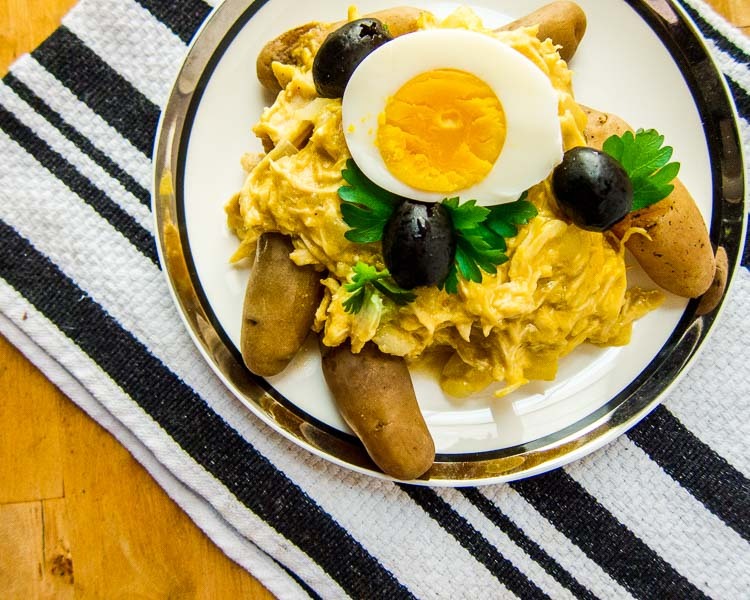 All in all, I found aji de gallina to be a simple tasty dish that will have broad appeal. Your family and kids will love it!